The green crab was listed as one of the world's 100 worst invasive species. Do I have to be vegan to combat climate change? Can I borrow a cup of electricity? Do you want fried ants with that? Along the New England coast, populations of an invasive species have surged to overwhelming and devastating numbers. With no predators to keep them in check, the European green crab wreaks havoc on eelgrass, clam beds and oyster beds — much to the dismay of local fishermen and chefs. The North American green crab invasion goes back 200 years, when the creatures began infiltrating our shores as stowaways on water boats. Today, they are listed by the International Union for the Conservation of Nature as one of the world’s 100 worst invaders. 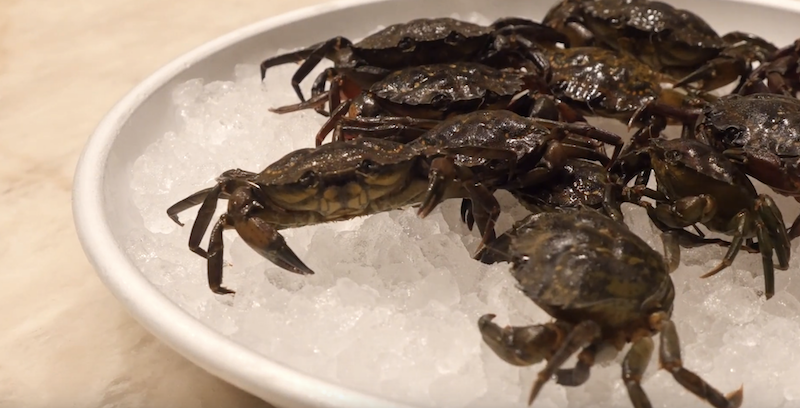 Christopher Cryer believes reducing its astronomical populations will fall to the green crab’s ultimate predator: you and I. Cryer, executive chef at Seamores, a seafood restaurant in lower Manhattan, is exploring creative ways to cook up these crabs, including a specialty ramen dish. Cryer says sustainable seafood is about eating what our shores have to offer. If we want to preserve the species we love — or love to eat, like oysters and clams — then we have to do our part to preserve their habitat, even if that means eating species like the green crab, too.